Mărţişor (Romanian pronunciation: is the traditional celebration of the beginning of the spring (and until 1701 of the New Yearin) Romania, Moldova, on the 1st of March. The day’s name is the diminutive of March (in Romanian Martie), and thus means something like “little” or “dear March”. Nowadays, men offer women a talisman object also called Mărţişor, consisting of a jewel or a small decoration like a flower, an animal or a heart, tied to a red and white string. However, giving a little nickel tied to a red and white string is an old custom and was originally designated for both men and women. 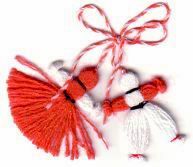 It was believed that the one who wears the red and white string will be powerful and healthy for the year to come. The decoration is a symbol of the coming spring. A woman wears it pinned to her blouse on this day and up to two weeks after. Occasionally, women also give such gifts to men. In some parts of Romania such as Moldova or Bukovina the symbol of spring was a gold or silver medal which was worn around the neck. After wearing the coin for twelve days, they bought sweet cheese with the medal, because it was believed that their faces would remain beautiful and white the entire year. Bulgarians also have a similar but not identical holiday on March 1, called “Martenitsa”. If and how these two holidays are related is still a matter of debate between ethnologists. Mărţişor is the symbol of spring and also a celebration on the first of March. Its beginnings are still a mystery, but it is usually said that it originated in ancient Rome, because New Year’s Eve was celebrated on the 1st of March (Martius), the month of the war god Mars. He had a double role: both protector of agriculture and of war, so the celebration signified the rebirth of nature. The duality of symbols is kept in the colours of the Mărţişor: white and red, meaning peace and war (it might also symbolize winter and spring). For the Thracians, Marsyas-Silen, whose cult was related to the vegetation and the land, had the same attributes. The flower and nature celebrations were consecrated to him. This custom can be found in all areas where Romanians live. This entry was posted on February 27, 2010 at 11:57 pm and is filed under Uncategorized. You can follow any responses to this entry through the RSS 2.0 feed. You can skip to the end and leave a response. Pinging is currently not allowed.